Here's a comprehensive database of third party coin grading services or TPGS. Only four grading services are trusted and actually increase the value of a coin and they're PCGS, NGC, ANACS and ICG. 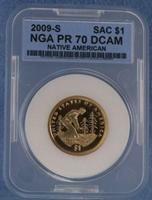 The fact is, most dealers, numismatists and experts accept NGC and PCGS as the most consistent and reputable services. When you look for ultra-rare coins, coins that trade for thousands, hundreds of thousands or even millions of dollars they're are always graded by either PCGS or NGC. There's a reason that they're chosen to authenticate, certify and grade the most valuable coins on the market. It's because they're the best, no matter the claims of other TPGS or dealers or ebay coin sellers. If you want to be informed on some of the ebay sellers who holder and grade their own coins then read these articles I wrote from years of experience. I promise it will save you money! All grading services beside PCGS, NGC, ANACS and ICG are considered second tier or less grading services with SEGS, PCI, NTC are examples of second tier grading services. All the rest are third tier or lower grading companies and some don't even except coin submissions from the general public and can be called third party grading services at all. Ebay is flooded with coins graded by a copious amount of different grading companies. Many of these companies are "basement" company, third party graders, practicing grading techniques that are suspect. Also, there are many horror stories of these companies grading counterfeit and damaged coins in their holders, but sold as authentic. Often, the dealer company (seller) might own, or is personally affiliated with the some of these "slabbers" and this creates a conflict of interest. A circumstance that can introduce the unethical practice of starting grading companies for the sole purpose of selling more coins, at a higher premium, by assigning grades that do not meet the accepted standard for that particular grade. When looking slabbed coins, one should always question the grade of the coin. If the holder is not from a top tier grading company, then make an offer or bid that matches the book value (BV) a couple of grades lower than the holder states. Also, look for certain other details like the coin's letter or date fonts, wrong mint mark year, etc. Try to compare the coin using an authentic example to be sure the coin in the holder is authentic. Another detail that requires attention-anyone can buy the Coin World holder (known by the little earth symbol in the bottom left hand corner of the holder), put a coin inside, and affix a label that states any grade they chose. This is important, because there exist many examples of coins that jump in BV from grade to grade. One example of note is the 1884-S Morgan Silver Dollar. The price dramatically increases from AU58 to MS60, and this coin is difficult to find in mint state, and is one of the most over-graded coins on the market. Disclaimer: Some of the information on this page is the opinion of the author and is not meant to accuse, discredit or cause injury or harm to any third party grading company. However, this information is based on years of experience and should serve as a guide for a potential buyer of a graded coin. Although the author attempted to use the most current and accurate information, the author is not responsible for any errors or omissions contained in this site.